I know lot of people are interested about the constructions of the proposed 1 kilometer (1000 meter) tall Kingdom Tower building in Jeddah, Saudi Arabia. If its ever built it will become the tallest building on earth. So here are some fresh Kingdom Tower Jeddah construction pictures. They don’t show much but definitely indicate the start of piling for the construction of the mammoth tower. These Kingdom Tower construction photos were taken Mr. Rody Alshafei on the 18th of April 2013. Commenting about these pictures Mr. Rody says, “I went to the [Kingdom Tower] site today, work has finished in some foundations, concrete mixing towers are suddenly appeared. On the other hand, they have made a fence around the Tower’s plot to separate the Tower’s site than the rest of the plot (kingdom City)” Here is a video Mr. Rody had post on YouTube showing the whole Kingdom Tower construction site with the piling work and machinery. About a month ago, a Saudi Newspaper had reported that the Kingdom Tower construction will finally start from the 1st of April 2013. Here is a diagram comparing a 1000m version of Saudi Arabian Jeddah Kingdom Tower to other tallest buildings in the world today like the Dubai Burj Khilafa, Empire New York State Building , China World Financial Center tower and the new New York City One Freedom Tower. I know lot of skyscraper fans were frustrated with lack of information and pictures about the progress of this Jeddah Kingdom Tower. It was proposed way back in 2007 but nothing was done upto now except erecting a fence around the site and some test drilling a few years back. Now finally those eager fan have got their wish granted! The construction of this tower may have taken so long to get started most probably because of the financial crisis of 2008-2009 that affected the booming real estate market in Dubai and Middle East very badly. But I also think it can be because of the highly divided reaction the Kingdom Tower received throughout the media and public. Many real estate investors and journalist still see the iconic 1 kilometer Jeddah Kingdom Tower as nothing more than the result of self-centered and attention seeking competition between oil-rich Arab nation states that will serve no purpose other than as a white elephant, costing more and generating less than expected, if it even gets built! Here is the 1450 feet tall Lodha World One Mumbai Residential Skyscraper. It is currently India’s tallest building under construction and is a residential skyscraper with a proposed height of 442 meters and 117 floors! According to some claims this Mumbai World One skyscraper will be the world’s tallest residential building once completed! Giant Towers agrees with this claim because the supertall Pentonium building in Dubai, which was set to become the world’s tallest residential tower with a height of 516m and 122 floors, is currently on hold for a long time. Even this World One tower was schedule to be completed by 2014 but according to latest news from Lodha Group the building will be inaugurated somewhere in the first quarter of 2016. Below is a view of how the Mumbai skyline will look once the World One building is completed. You can clearly see how tall it is against the other skyscrapers in Mumbai. At any rate, this Mumbai World Tower will be India’s tallest building for sometime at least, because the construction work on the proposed tallest building in India, the 700 meter, (126 floors) Mumbai India Tower has been put on hold since 2011. Mumbai World One building will house about 300 super luxury homes, including three and four bedroom residences, villas with own private pools and a limited number of luxury mansions as well. The apartment prices in World One would start from INR7.5 crore (US$1.4 million) and the most expensive one be as much as INR50 crore (US$9.2 million). The project will cost INR2000 crore (US$370 million) and Lodha Group expects to earn a revenue of INR5000 crore (US$920 million) from the sale of the apartments according to Wikipedia. We can see that this building has already won the hearts of many Indians by the many names by which they refer it such as, the World Towers Mumbai, World One Lodha and Mumbai World One among others. Above graphic renderings of this wonderful giant tower are from the Skyscrapercity forum. Anyone looking at the Toronto skyline will notice the very tall Toronto CN Tower that stands-out head and shoulders above other buildings in Toronto, Canada. But the Toronto CN Tower is not generally considered a high-rise building as it does not have successive floors that can be occupied even though it is the tallest man-made structure in Toronto and even in North America. The title for the tallest building in Toronto is currently held by the First Canadian Place, which rises 298 metres (978 ft) tall in Toronto’s Financial District. First Canadian Place has held on to the title of being Toronto’s tallest building since it was completed in 1975. However we have got news that this honor will change hands in the near future. A Vancouver based developer called Pinnacle International has now proposed to build a 88 storey (272m) building in Toronto. This building is going to be part of a mega development proposal for a tract of downtown land in Toronto that is bounded by Yonge and Freeland Streets, Lake Shore Blvd, and Queens Quay. Here is a graphic drawing of the proposed mega towers. Proposed development includes 6 new Hariri Pontarini-designed buildings alongside a vertically-extended incarnation of the existing 25-storey Toronto Star building, with an eastbound extension of Harbour Street planned to run through the middle of the plot. The north block would contain 4 new primarily residential buildings are set to rise to heights of 75, 80, 80 and 88 storeys, the tallest of which is planned to rise 272 metres, measured to top of the uppermost floor. On the south block plans call for a 70-storey hotel and condominium tower, a 40-storey office building, and a 10-storey addition to the current Toronto Star building, bringing the total height of the structure up 136.0 metres. These days, we here lot of proposal for super-tall building like this in Western cities facing opposition from various city planners and urban cogestion issues not to mention opposition from local community. The final result is the buildings that are built in these locations are significantly smaller than the original proposals. We hope that doesn’t happen to this proposal and it really gets built soon. This is news from a popular email forward that’s going around these days called the Olympic Tower 2016. That email had these pictures of a giant solar-powered building with a waterfall falling from the top of the building to the bottom covering the whole front facade of the building. Like you can see in the pictures here looks like a giant cascade of water suddenly appearing in mid-air and falling down from the sky. According to the email this tower will be both an observation tower, and a welcome sign for the visitors arriving by air and by sea for the 2016 Rio de Janeiro, Summer Olympic Games. However contrary to claims there no guarantee yet from the Brazilian Rio Olympic Games organizers that this building will ever be built. So it is still just a concept and pictures from a architecture firm’s proposal of a wonderful building submitted for a competition in 2009 by RAFAA, a Zurich based architecture and design studio. www.hoax-slayer.com, a website that analyses interesting email forward like this, had contacted the designers to verify this claim and they have said that they, “don’t have any confirmation from the local authorities so far and don’t know if this project will ever happen! This tower will have lifts that will take the visitors to the top, where the view will be fantastic. It also includes plans for bungee jumping from a special platform. The designing firm RAFAA, also want the organisers to also consider another important point by building this solar powered tower. In 1992, Rio de Janeiro hosted a famous United Nations Earth Summit, which is still talked about today. The proposal designers wanted Rio to once again be the starting point for a global green movement and for a sustainable development of urban structures and homes. They say, it will perhaps even become a symbol for the first zero carbon footprint Olympic Games. How marvelous it will be if this building get built? Update: I later found out that the tower top will be 105 meters above sea level. But there was no mention of how tall the tower only will be or other important details about we hear in other tower design proposal or news. Panama is world famous the Panama canal. Other than that is it not very well known. So for many in the rest of the world, Panama might look like a unlikely place for skyscrapers and tall buildings. What is not very well known about this country is that the countries capital, Panama City is booming with a impressive skyline of skyscrapers and tall buildings. Even the famous US Investor Donald Trump choose Panama for his first skyscraper investment outside of United States by building the sail shaped 70 storey Trump Tower Hotel in Panama City. That Trump Tower is currently not only the tallest building in Panama but also the tallest building in Latin America. Just imagine tiny Panama having the tallest building in the whole of South America beating its giant neighbors with densely populated cities and booming economies like Brazil and Mexico! 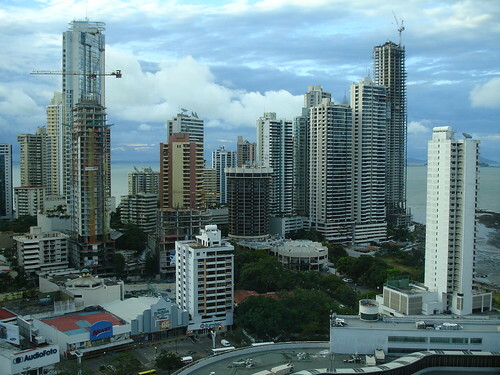 Starting from around 2000, Panama city saw a rush in skyscrapers and now there are more than 150 high rise building are in this city. There are many more tall buildings currently under construction in this country and new proposal for even taller buildings are constantly coming out. The latest in this is a proposal for a new 320 meter or 1050ft tall skyscraper called the Central Tower. You can see some computer generated rendering of this proposed new super tall skyscraper building here. If this is built soon it will become the tallest building in Panama city as well as Latin America. Here are the highlights and features of this 320 meter first super tall skyscraper for Panama. If it is built it will be not only the tallest building in Panama but as well as the tallest building in South America. Property Description : The Central Tower will be a large commercial building with a 5 star hotel in the heart of Panama City’s downtown core. Panoramic views of the city and Pacific Ocean are available. Complete floors from 1000 sq. m to 1250 sq. m are available.